BATON ROUGE – Students and staff at the for-profit Virginia College near the Cortana Mall were shocked with news from school chiefs Wednesday that the college was closing. And, it’s not just the Baton Rouge campus. In an email obtained by WBRZ, officials warned employees the entire Virginia College system was closing. “...the Department of Education added requirements that made operating our schools more challenging. In addition, last night ACICS suspended our schools’ accreditation with intent to withdraw. The uncertainty of these requirements resulted in an inability to acquire additional capital to operate our schools,” Stu Reed, the CEO of Virginia College’s parent company, wrote in the email. The for-profit college focuses on technical training careers – ranging from medical services to culinary disciplines. Earlier this year, it warned it was no longer admitting students. “It is with extreme regret that this series of recent circumstances has forced us to discontinue the operations of our schools effective with the completion of the current module or term for most students. There will also be a small group of employees to provide an orderly closure process for a short period thereafter,” Reed wrote. Employees were told to check with supervisors about when their “last day of employment” would be. All employees were told they would receive wages for time worked along with accrued but unused vacation. 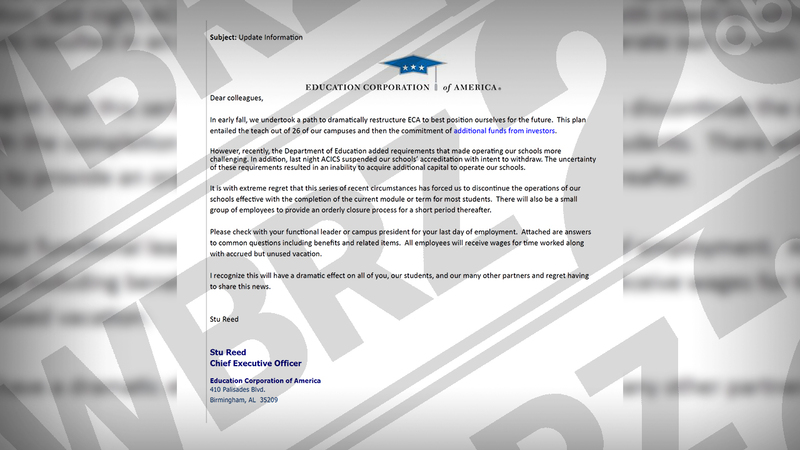 The Education Corporation of America plans to work with students to ensure access to their transcripts so they can complete their studies at another school. The idea is to transition students who haven't completed their courses into another program at another proprietary program in the area. There will be an option for refunds if the student chooses to take that route. Virginia College in Shreveport will close Friday, December 7, and the Baton Rouge location will close December 18. Students will be able to finish this semester, take their finals, and walk for graduation if they qualify.